A circa 1796 map of North Carolina that includes Glasgow County. Image from the State Archives. On November 18, 1799, Glasgow County, in eastern North Carolina, was renamed Greene County. In 1791, Dobbs County was split. Half became Lenoir County, named for Revolutionary War General William Lenoir, and half became Glasgow County, for North Carolina’s first Secretary of State James Glasgow. Among other duties, Glasgow oversaw the military grant program that awarded land to soldiers who served in the Continental Line during the American Revolution. Warrants for land were easily forged, which led to Glasgow’s downfall. In 1797, future President Andrew Jackson wrote a letter to the governor exposing the ongoing land frauds. Charges became official, and Glasgow was brought to trial. The jury handed down five indictments; Glasgow pled not guilty. After ten days in court, Glasgow was found guilty of three charges: issuing a fraudulent warrant; issuing a duplicate warrant with two separate grants on it; and issuing a grant without proper evidence of the assignment. The residents of Glasgow County did not want to be identified with a criminal and the county was renamed Greene, for Revolutionary War hero Nathanael Greene. While Glasgow’s name disappeared from the map, his misconduct left a lasting mark in North Carolina’s history. The court that tried Glasgow ultimately became the North Carolina Supreme Court. On May 15, 1950, W. E. Debnam published Weep No More, My Lady, his response to former First Lady Eleanor Roosevelt’s newspaper column earlier that year. After the war he stepped into his news commentary role. First on the radio and then in a widely-circulated 60-page softcover book, he took Mrs. Roosevelt to task. He attributed the South’s weak economy to Sherman’s destructive campaign during the Civil War and to the “tragic era” of Reconstruction. Race relations, Debnam contended, were better in the South than in northern cities. Debnam’s book reached a ready audience, selling a half-million copies at 50 cents each. Highway marker in Mecklenberg County that honors Nathanael Greene. 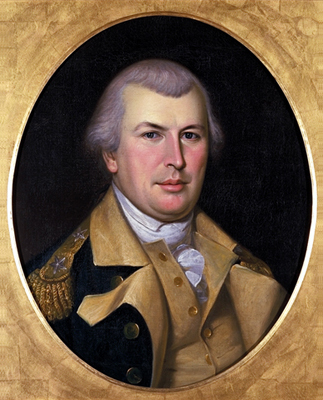 On October 22, 1780, General George Washington ordered Major General Nathanael Greene to assume command of the southern army. He assumed command in Charlotte, Dec. 3, 1780. Born in 1742, Greene was raised in a Quaker household that denounced warfare. He nevertheless developed a keen interest in military history and tactics as a young man, and was expelled from his Quaker meeting in 1773 for having attended a military parade. Subsequently joining the local militia, he took an active role in early efforts towards American independence. At the outbreak of war, Greene moved swiftly through the American ranks, and was promoted to brigadier general in 1775 during the Siege of Boston. The next year, at the age of 34, he became the youngest officer promoted to major general in the Continental Army. Greene was one of Washington’s closest confidants and respected commanders throughout the war. As commander of the Southern Army, he performed remarkably, and proved himself a genius of strategy and logistics. His command of American forces directly led to the British defeat at Yorktown in 1781, and therefore ultimately to American independence. Greensboro and Greene County are both named in his honor.